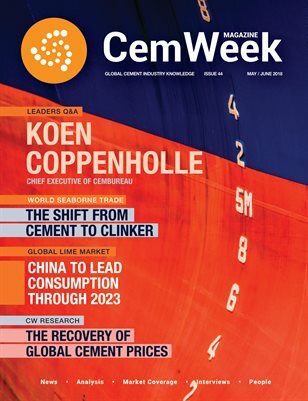 The 44th issue of CemWeek Magazine features an exclusive interview with Koen Coppenholle, Chief Executive of CEMBUREAU, the European Cement Association. CW Research presents its thorough analysis of the current world seaborne cementitious trade market, as well as a forecast that includes trade trends for the upcoming five years. Additional focus is given to the global lime market, including a forecast of consumption trends through 2023. Looking back on the first quarter of the year, CW Research tracks pricing movements for gray cement in major cement trading markets. Additionally, CemWeek focuses on the cement market in Colombia and elaborates on the country's plan to upgrade transportation and boost the cement market.